Taipei, April 2014 – MSI announces the launch of the MSI ProBox23, the first model in its new generation of commercial oriented barebone PCs. These series use the latest Intel® H81 chipset, and support the 4th Generation Intel® Core™ processors with high performance and integrated GPU providing powerful graphics processing. Furthermore, the MSI ProBox23 is equipped with a thin mini-itx motherboard and energy efficient CPU cooler. With a length and width of only 20cm and a height of just 5cm, this barebone PC is one of the smallest in its kind. Moreover, the MSI ProBox23 can easily be mounted behind a monitor, making it the best space-saving solution for commercial and entertainment applications. The MSI ProBox23 is available worldwide per beginning of April 2014. MSI’s new thin Mini-ITX barebone can be equipped with Intel® Core™ i3, i5 and i7 processors. The MSI ProBox 23 also includes a highly efficient CPU cooler, which is custom designed and supports CPUs up to 65W TDP. It promises the user will experience a high system performance and there is no need to compromise between size and power. The CPU cooler is smartly controlled by the system to provide the best cooling and an excellent balance between noise and performance. ProBox23 is designed for users and commercial enterprises that require a high performance and space saving solution altogether. The custom VESA mount is custom made to save space. With just one screw, the MSI ProBox23 can be mounted easily and neatly behind a monitor. Furthermore, the mount is flatly designed to reduce the distance between the monitor and a wall. 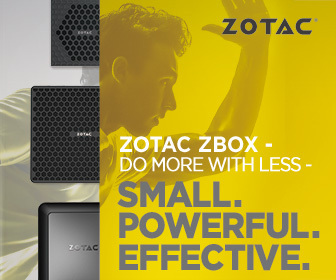 With a capacity of just 2.3 Liters, the tiny sized ProBox23 saves a lot of space compared to traditional desktop PCs. A standard ATX tower is easily bigger than 30 Liters and now with the new ProBox23 MSI can provide equal performance. With MSI ProBox23 there is no compromise between size and performance. Despite of the tiny thin Mini-ITX form, MSI ProBox23 still provides plenty of internal extensional ports, including an mSATA port and a mini PCI-E port. With the mSATA port, it’s possible to install a mSATA SSD and upgrade the storage access speed. Besides that, the mini PCI-E port enables the user to install the latest 801.11ac WiFi module, meeting the needs of both commercial application and entertainment applications. Tinkering with computers and other electronics since the days of the Apple IIe and the Intellivision as the Prodigal 80s child, Jeremy seeks to constantly expand his knowledge of the ever-changing and ever-enticing world of Consumer Electronics. He enjoys tinkering, overclocking, modding, and most of all gaming.